At the core of it all is Mother Nature. She will survive, but will we? Now is an opportunity to individually live our life in a loving, thoughtful way, treating others, and the planet as part of us. We truly are one. This work depicting a heart is the basis of everything. 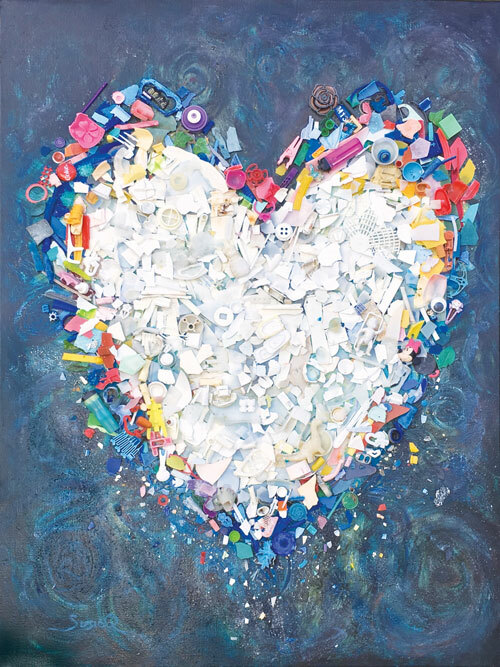 It's made up of hundreds of pieces of plastic picked up from the local Broward beaches, cleaned and sorted before applying to the work. There is only one item included in the artwork that is natural to the beach, a piece of shell. Can you find it? For proper display, the work should be framed and placed under glass. Prints by request. Now available at Frame 'n Art Gallery, 229A E. Commercial Blvd., Lauderdale by the Sea, Florida 33308. Phone: 954.267.9202.